News from Superchips Ltd, the world leader in car ECU remapping for power and economy. Improve your Transportation! 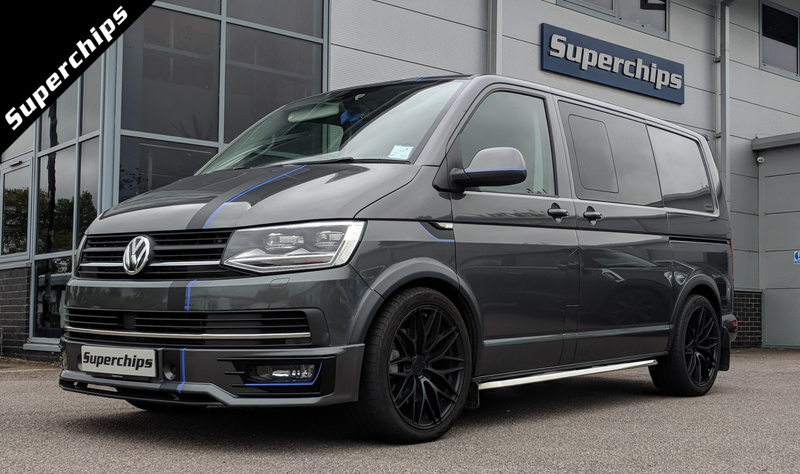 T6 Transporter remap range now complete! Following the release of their conversion for the lower output Transporter earlier this year, world ECU remap leader Superchips has now introduced a product for the most powerful version in the range, using the 204PS BiTDI version of the 2.0 turbo-diesel engine. Using the latest Delphi engine management, the bi-turbo diesel engine leaves the factory with 204PS but the Superchips remap adds significantly to both power and torque. Power increases by 40BHP at 3966rpm while torque – arguably more beneficial for a light commercial vehicle – grows by an even more impressive 73Nm at 4051rpm. The full power and torque curves can be seen on the website listing for the vehicle at the bottom of this page. Examination of the torque curve reveals a broad increase across the whole RPM range, with more torque than the stock figure until over 4000rpm, creating a smoother and more refined driving experience as well as gains in fuel economy of up to 7% – a huge benefit for the light commercial fleet, providing potential cost reductions when driven in a comparable manner.